My brother-in-law works in the racing industry for Porsche (a seriously cool occupation), and just when I thought it couldn't get any cooler, Haribo was a Porsche sponsor last year. 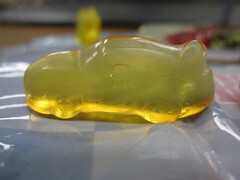 My brother-in-law kindly sent me some of the special Porsche gummies so that I could blog about them! I can't write much about racing, since I am woefully ignorant, but I do know gummies. Haribo gummy bears were one of my favorite supermarket checkout treats as a child. Compared to most fruit snacks, Haribo was leagues ahead. The little bears looked like shiny gems, and I have fond memories of biting off the heads of different colored bears to make hybrids while watching Eureeka's Castle. To this day, eating Haribo gummies reminds me of that show. Some of the gummies didn't survive the summer mail, but the ones that did were in the form of cute little shiny cars fancy Porsche racing cars. This was definitely a promotion I could get behind! Of course, the gummies gad that nostalgic (and delicious) Haribo gummy bear taste. 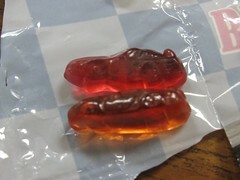 Haribo gummies like this fall on the firmer side of the gummy spectrum, and most of the flavors are pretty ambiguous. The apple stuck out in particular, but for example, clear just tasted like clear gummy bear (I think it's supposed to be pineapple). I was always partial to the orange, which was more sweet than tart. 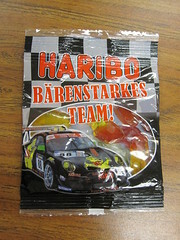 In short, Haribo gummies are just as good as they ever were, and the Porsche racing promotion certainly impressed me!